Scandal returned last night and with all the talk of how closely the series has predicted and mirrored reality, we had to expect the worst. Terrible things are always in the forecast on Scandal, but last night’s season 6 premiere was especially grim and perhaps even lightly triggering. 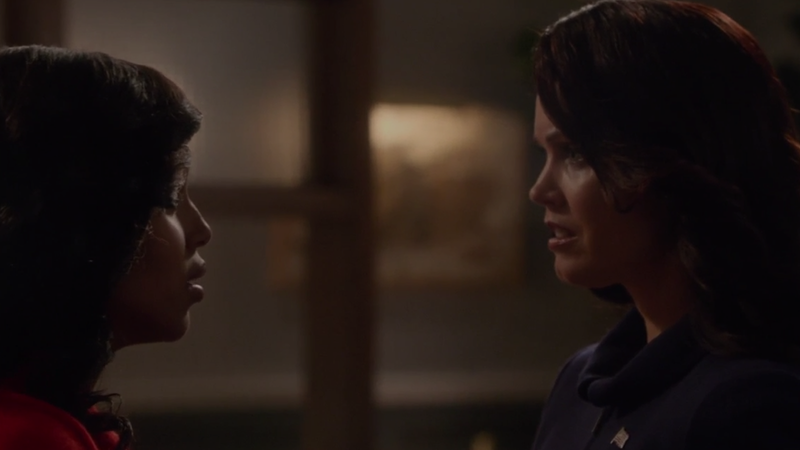 The episode opens on Election Night with Olivia scrambling to figure out electoral college numbers between Mellie, whose campaign she’s working, and Governor Francisco Vargas, a candidate groomed by the endearingly devilish Cyrus Beene. It’s a race so close it comes down to one county in California. The winner is: Not Mellie. As reality sets in and Mellie is forced to concede to Vargas, the stunned reaction from her campaign plays like a strange TV world parallel to Hillary Clinton’s depressing upset, a scene that likely made lots of viewers relive their own Election Night horrors. “America has made its choice and its not you. Do you hear me? We lost. You lost. They won. It’s over,” Liv tells Mellie and us. How uncomfortable. Anyway, since Scandal happens to have the worst security on Earth, President-Elect Vargas is shot right on stage during his acceptance speech. You win some, you lose some. This premiere was intended to air the night before Inauguration Day, but the date was allegedly pushed back so that ABC could air its Donald Trump special. In retrospect, that seems like both a convenient excuse and a good decision to avoid showing a touchy assassination plot right before a detestable president is sworn in, which would have certainly been a controversial juxtaposition. In the episode, Vargas’ death is drawn out to make it seem like he has a chance of surviving, but the title of the episode here is “Survival of the Fittest” and Vargas is not nearly ruthless enough to make it in this business. Make way for a new president. But who? Legally, one would think this means the Vice President Elect—in this case, Cyrus—becomes president. Yes, but no. Here’s where the show loses me then reels me back in with its amazing unreal logic. David breaks the situation down flawlessly to Fitz in a Well, Actually speech, explaining that Vargas only won the popular vote, not the official electoral college vote. Technically, there’s no precedent and the next president could be anyone. “Legally, the next presidency is wide open, but practically I think it makes an enormous difference what you do,” David tells Fitz. “The reality is, Mr. President, the next president of the United States is who you say it is,” which is convenient. In the meantime, the dysfunctional killer trio of Huck, Quinn and Charlie team up to investigate who could have ordered the assassination. Apparently, it wasn’t the work of Papa Pope. Liv suspects that Cyrus is the culprit; for one, because he stepped ever so slightly away from Vargas right before he was shot on stage. Liv then changes her mind after she discovers Cyrus in the hospital still seemingly in shock and covered in blood. A lost voicemail ends up being the key to the murder and it appears as if Cyrus indeed ordered the hit. But maybe not because this is Scandal and anything can happen. Either way, it’s kinda too late because Fitz, in his infinite power, has already made Cyrus the president. It’s fitting and precious because this is exactly what Cyrus has been desiring ever since he started scheming and killing a bunch of people to fulfill his American dream. Except now, Liv is out for blood.